ABA Journal: Asked and Answered features top of the industry guests discussing various legal topics. Pete Wentz shares how to address online controversies at the right time and what commonly given legal advice turns out to be the least helpful in putting out fires. Roula Allouch gives advice and information about tactics you can use to protect yourself from a bully on the bench without hurting your client's case. Janice Brown discusses how to be confident when speaking with a potential client, and gives listeners tips drawn from her own experience explaining legal fees and retainers. Marsha Johnson-Blanco talks about how attorneys can help on Nov. 6. Sondra Tennessee shares her advice on how students, parents and school administrators can foster students’ independence and success. In this episode of the Asked and Answered: Lived and Learned series, Michele Coleman Mayes discusses improving your relationship with someone by using certain types of communication. In this episode of the Asked and Answered: Lived and Learned series, Lucian Pera says that he's learned that everyone, including lawyers, can use an outside perspective. In this episode of the Asked and Answered: Lived and Learned series, Cruz Reynoso discusses how his father's philosophy as a farmworker inspired him as a labor rights advocate and attorney. In this episode of the Asked and Answered: Lived and Learned series, Bobbi Liebenberg says she's learned that laughter has a place in the workplace. In this episode of the Asked and Answered: Lived and Learned series, Andrés Gallegos says he learned never to let anyone else's perception of his capabilities limit him in achieving his dreams. Terri Morrison discusses how to not offend clients and alienate foreign judges and arbiters even with the hurdle of cultural differences. Brian Cuban shares about his decades long struggle with body dysmorphic disorder, and how he learned to address it. Where are the jobs for the class of 2018? Stephanie Francis Ward speaks with Valerie Fontaine, founding partner of the legal search firm SeltzerFontaine, about which in-demand areas of law have open job positions–and how law grads can secure them. Wellness is not just about eating health food and exercising. Hear from Jolene Park, founder of Healthy Discoveries, a corporate wellness company. E-discovery and privacy law should be two areas that legal tech jobseekers look into, Shannon Capone Kirk tells the ABA Journal's Stephanie Francis Ward in this episode of Asked and Answered. Nancy Levit shares tips on how to find the work you want to do, and how to find joy in the work you're already doing. You’re in a pickle. Can a lawyer assistance program help? Bree Buchanan talks about how lawyers assistance programs work, and how a person can reach out for assistance. Adam Minsky, author of "Student Loan Debt 101," shares tips and tricks for managing debt and regaining control of your personal finances. 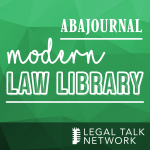 This special ABA Annual episode covers diversity and what will truly drive change within the legal profession. This legal podcast discusses how lawyers can advocate for themselves in the workplace, without getting in their own way. This legal podcast dives into getting certified as a minority-owned law firm for government or private-sector programs. Are schools that fail to teach children to read violating their Constitutional rights? In 2016, a group of lawyers filed a federal civil rights claim against the Detroit public school system. We interview Carter Phillips, one of the attorneys representing the plaintiffs. In this month's episode of Asked and Answered, Stephanie Francis Ward speaks with Sara Sutton Fell about lawyers working remotely. Stephanie speaks with Jeffrey Rachlinski, a Cornell Law School professor who has done various studies about implicit bias, including one that focused on trial judges. How law students who have failed the bar exam should go about preparing to retake it - without fear or anxiety. Kathleen Kelley Reardon talks about how attorneys can ask for what they want without jeopardizing good work relationships. Is it time to leave your current job? Gayle Victor, a Chicago-area lawyer and social worker who counsels attorneys, discusses whether you should leave your law firm. Business development coach Larry Kohn discusses ways that attorneys can promote themselves and their skills, helping the lawyer and their potential clients. Kandis Gibson has some tips and tricks for how lawyers can make exercise and outdoor activities part of your routine. Can you plan to prevent workplace bias before it starts? In some cases yes, says Joan Williams, the founding director of the Center for WorkLife Law at University of California Hastings. The ABA Journal’s Stephanie Francis Ward discusses with Williams tips on how to create what she calls “bias interrupters” to head off potential discrimination. How can you attract positive media attention for yourself or your clients?